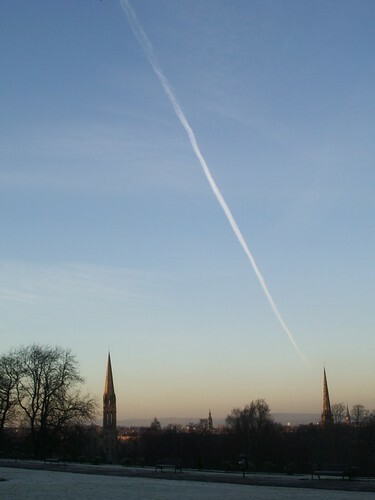 This is my favourite of the photos that I took at Queen’s Park the other day – I’m not often brave enough to take a nearly full-shot sky picture, but the vapour trail was so striking I gave it a try and was pleased with the result. I think it has quite a magical quality – kind of like “E.T.” or something! I’m going to be away for a few days over the new year, visiting friends and family down south. Magic pictures will still appear though, and I should be back by the start of next week, but unfortunately I’ll be unable to answer comments or visit your blogs till then. 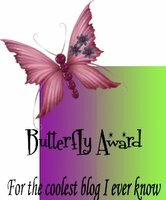 I know not everybody is mad on these blog awards or find the cutting and pasting and whatnot a bit stressful, so I won’t be at all offended if you don’t want to pick them up, but just take this as a little end-of-year sign of my appreciation of your blogs. 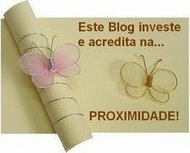 PS Sorry about the Comments Off thing – I’ve no idea what happened there but I’m glad I saw the first few emails today! They’re on again now – better check the others now! 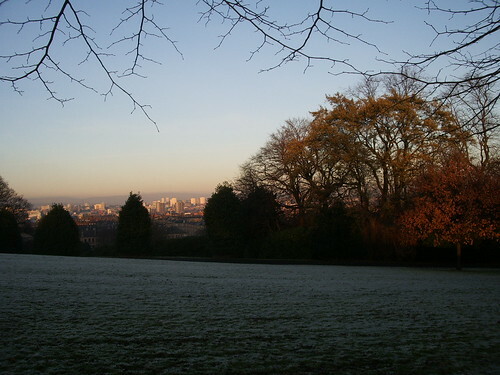 This is the view from Queen’s Park towards the east end of the city. I liked how the fading sunlight caught the trees on the right. This is from higher up in Queen’s Park (it’s the same church spire as yesterday). 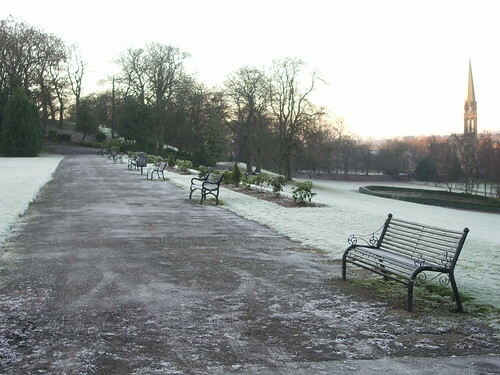 You can see the extent of the frost better in this picture. The view beyond the church is unfortunately rather bleached out in this picture – from here there is a fantastic view towards the city and to the hills beyond. It seems really odd to me that they put the park benches facing away from the view. For the next week (apart from January theme day) I’m going to show some photos from Queens Park, from our walk yesterday (27th). As you can see it was very frosty (some of the later photos show the frost better), and despite all day sun it was showing no signs of melting. 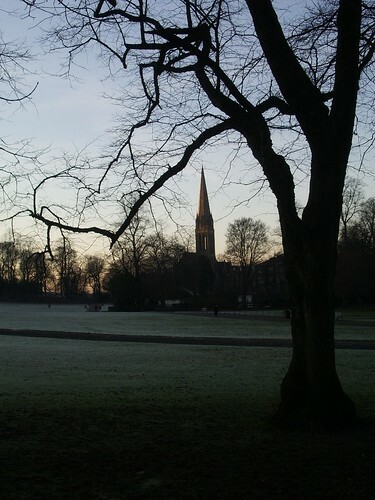 The church in the background is Queens Park Baptist Church. I am so lucky having this park on my doorstep. It looked gorgeous covered in frost. 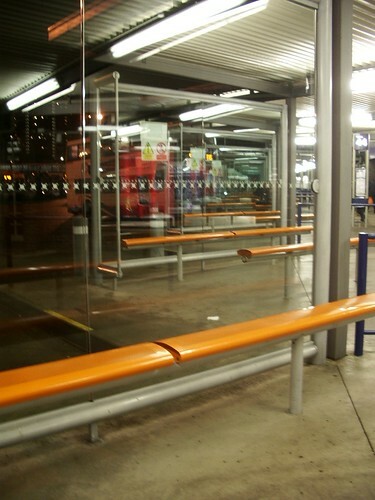 If you arrive in Glasgow by coach or bus from elsewhere then the chances are this is where you’ll end up. I got to know Buchanan Bus Station far too well this year (especially stance 46 which is the one from which the airport bus leaves) as I’ve spent a lot of the year commuting between here and Down South. I’ll be quite happy for less commuting in 2009 – let’s see what the New Year brings. 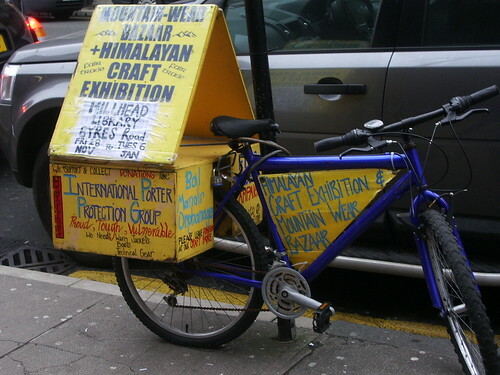 I saw a couple of these bikes up and down Byres Road earlier in the week, advertising an exhibition of Himalayan craft and mountain gear which is taking place at the Hillhead Library until 6th January. Well, I cried like a baby during “It’s a Wonderful Life” – how on earth have I not managed to see it before now?! I wasn’t too embarrassed, as I could hear plenty of sniffing going on in the cinema so knew I wasn’t the only one! And now it’s Christmas Day – here’s wishing you all a very happy Christmas, and thank you for all your visits and comments here this year. I hope you have a peaceful and joyful and very happy day. 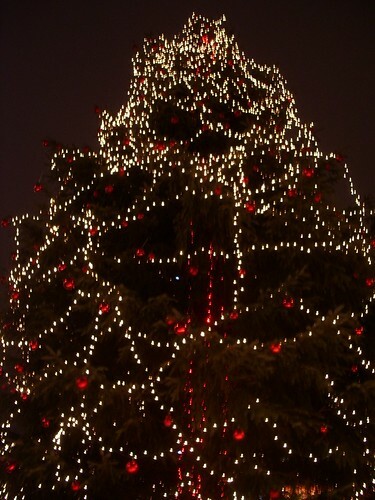 This picture is of the George Square Christmas tree, by the way! 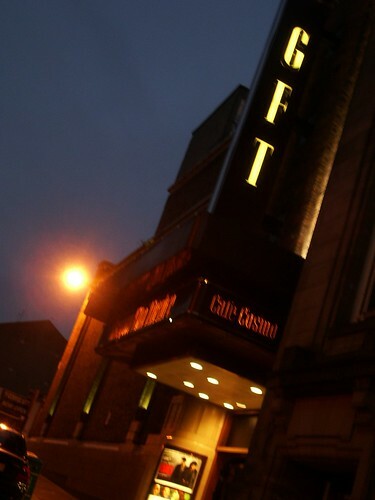 For the last 2 or 3 years the GFT (Glasgow Film Theatre) has shown the film “It’s a Wonderful Life” every day in the two weeks leading up to Christmas, finishing on Christmas Eve. I’ve never seen the film, and tried to go last year but left it till the last minute (in my defence I was just about to get married so had other things to think about!) so it was sold out. This year I’ve been a bit more organised and so later today we are going to see “It’s a Wonderful Life” – I can’t wait! 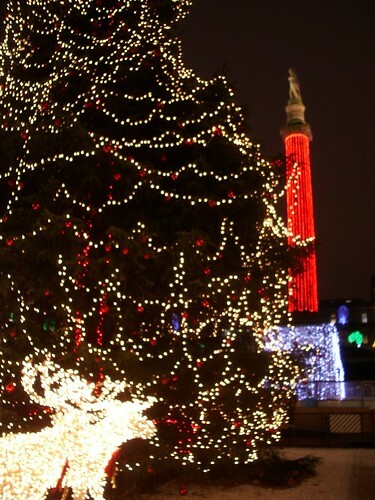 I have finally – in the last few days – started feeling like it might be Christmas soon. Having left everything till the last minute I still feel like I’ll be about ready for Christmas in about a fortnight, but as Santa waits for no-one I’ll just have to have to do the best I can in the short time left. I bought the last veggie haggis in Glasgow yesterday (or it felt like it anyway, it took several attempts to find a shop that had them and it literally was the last one in the shop I did eventually find it in). Yes I know vegetarian haggis is an oxymoron, and I’m sure Robbie Burns will be spinning in his grave at the thought, but we discovered last year that it goes really well with roast veg, so that is our alternative vegetarian new tradition for Christmas dinner. Back to George Square for today’s picture – a glimpse of the big Christmas tree, with the reindeer and Scott on his column again. There’s even a blob of holly right in the background on the right, just in case you were missing that. 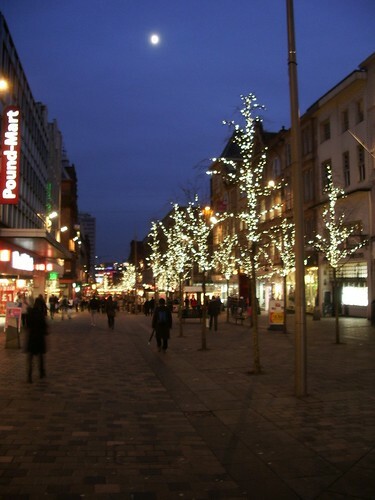 I’ve concentrated on the area around George Square and Buchanan Street, but Sauchiehall Street also has some lights this Christmas – more on the subtle side than in some years.